This project was a total makeover, a complete remodel, a real hit of the reset button. The previous owner had lived in the home for over 25 years. Its historic character as a true craftsman home was apparent with its rich wood paneling and dark Victorian wallpaper in every room. We redid everything, starting with stripping the wallpaper and painting all the wood panels, trims and molding in an airy white to breathe new life into the house. We went on to add more neutral, contemporary color to the walls throughout the house to set a calm backdrop for a curated mix of modern and eclectic furniture, fabric and accessories that Diane and David collected during their travels through Europe, Southeast Asia, and South America. Their collection of art pieces and old European maps from the Alameda flea market injected an adventurous, creative, and unique sense of design into the space. We selected a gold leaf chandelier from Anthropologie to serve as a crowning element to anchor and elevate the living room while highlighting the classic beauty of the woodwork and offering a nice contrast to the modern and rustic furnishings. 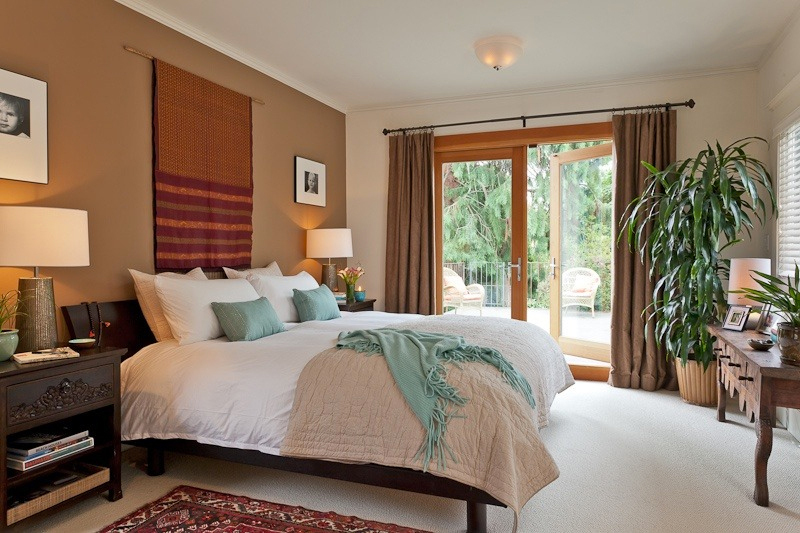 The master bedroom was transformed from a dungeon-like room to an airy and bright room by tearing down the back wall, putting in large Douglas fir French doors that open onto a park-like garden, and creating a modern European-style master bathroom.